A week after the New Year. Death while resurrection is celebrated. In the shock, horror, despair, and tears there comes the inevitable search for causes. The who, how, and why must be known. There’s playing into racist stereotypes as if the wrongdoers can be predicted in their wrongdoing by some purported formula. There are politicians vowing to catch the responsible as if their script allows them to say anything else. There are religious leaders publicly proclaiming the culprits must be pursued “mercilessly” as if their day job didn’t involve preaching forgiveness. There are cops taken off leave as if the state’s henchmen will restore order and bring justice. There’s outpouring of thoughts and prayers as if that will resurrect the dead. There’s censorship to control information spread. Then there’s curfew to control people spread. The search for causes will continue until those in power come up with a narrative a majority can believe or at least can pretend to believe. Yet none of that seems helpful. Perhaps then we may take to assessing general numbers. Number of bombs. Number of bodies. Number of injured. Number of loved ones. Number of funerals to be planned. Number of culprits to be punished. Number of years since a time like this had come to pass (10 by some accounts referencing the end of the war). We may gravitate toward the numbers because they provide a sort of respite from the irrationality. Or numbers might hold personal meaning. I was born in a time of curfew in 1989 that delayed the registration of my birth. I was terrified of the c word as a child internalizing the inevitable gloom that even the Colombo sunshine could not burn away. The word no longer strikes terror but is nevertheless still unsettling as I found out today. Maybe age makes one numb to fear. About 7 months after moving to the US, the Twin Towers were attacked. I’ve been back home a little over 7 months. Numbers seem just as unhelpful. That does not seem helpful either. For most of my life, I’ve thought about darkness. Yet, for a few months now, I haven’t. I’ve been wondering why. While daydreaming instead of studying for a law school midterm in the spring of 2013, I wrote the following words. I suppose in some ways it was a climactic time. It was the first time I realized I could not pursue law as a career. The time when I knew there had to be a different way forward but felt like I was lost in the fog. The time when the many contradictions of the past were about to come to a head and only sensing that such a collision might be inevitable. It was perhaps the most uncertain I had ever been. I wonder if I was generalizing through those words or actually confessing. It seems once the trauma of a religious upbringing subsides, questions linger about the extent of unlearning that must take place before life can go on. For me one key area of questions stems from the Catholic exclamation that everyone is a sinner. From there I had built a whole universal framework to explain right and wrong, good and evil. As a starting point, if sinning is evil and everyone is a sinner, then everyone is evil. Was I evil? That question preoccupied most of my childhood into my adolescence. After the pilgrimage to Arizona when I lost the church and a monotheistic god but found the spirits of the universe, that question no longer remains prominent. However, another remains. What had I lost when I stopped thinking about it? When I spent my days thinking about darkness, perhaps even living in its fog, there were words that came from no discernible place, at least no place I can point to. For years, I could hear words rhythmically ordering themselves without my assistance in my head usually when I had to internally and silently cope with external obstacles. There was no music, just words. Poems perhaps although with no formal training in literature I dare not qualify them as such. They were words about family, friendship, loss, love, and happiness. Heart stuff if you will. I would write them down, edit them for clarity, and save them for a time in my life when I’d appreciate them more. I haven’t heard such words for months, maybe even a few years. I wonder now if the words came and went with the darkness. Without being weighed down by catholic guilt and benefiting tremendously from books recommended by genuinely good people, the darkness seems to have dissipated. Or, I wonder if the years took the words away. Whether the words were childhood musings about dreams and hopes and ways to cope with a world that kept spinning outside of my control but time calmed the storm. Or, maybe I just ran out of words. Regardless of whether I miss the words, what I don’t miss is the darkness. Without it, at least without its constant preoccupation of my time, life seems to operate in color. In a world seen in color, the spirits seem friendly. If the words from five years ago were intended as a self-reflection, then maybe my life has indeed bore witness to the event. Even without me hearing about it in my head. Change is coming and there are questions as to why. It is argued the change is self-imposed, rash, and perhaps uncalled for. If I would just see reason, some say. If I would just be patient and give it some time, others argue. If I would just listen. There is an old report card I found from when I was very young where the teacher wrote that I “finally settled down and was obedient.” That seems to have remained true for most of my life. Since much of that time was spent within the walls of an educational institution, one could even argue that I had mastered the art of obedience. Now, however, another way forward is in order. My New Year's resolution this year was to jump fearlessly. While I can’t say I’ve completely mastered the fearless part as periodic jitters come and go, I will be jumping. But before I do, I’ve been thinking about what I’m taking with me as I jump and what I’ll be leaving behind. In those reflections, perhaps there is a why. What makes a memory last? Driving down the I-5 south toward Fullerton to meet an old friend from high school last weekend, I turned the bend and as the downtown LA skyline appeared amidst the traffic and haze the radio played "Don’t Stop Believing." In that moment I was transported through my high school class song to graduation day back in June 2007. As the song played fortuitously, I remembered being high-fived by my favorite history teacher after receiving the diploma cover. The more than a decade-old memory was so clear. I could feel the warm breeze on my face. Does a lasting memory depend on the people around at the time? Will I always remember the bus rides after tennis matches when the team sang songs too loudly? The music seems to echo through time and space. Will I always remember the retreat to Mammoth with board members of the Pre-Law Society? Will I always remember being sworn into the bar on a chilly December night uncertain what I was doing there? Those days were filled with a dangerous combination of youthful optimism and blatant obliviousness. Will I always remember the time a friend helped interpret during an intake interview with a deaf client? Will I always remember the water runs down at the border in Arizona? Will I always remember feeling proud as I watched students in my class grill an ICE agent at a detention center and then being asked to leave? Will I always remember seeing friends walk on water at the Salt Lake? Will I always remember walking through the redwoods on a cold August afternoon, seeing an enormous tree, asking my friend what we should name it, and then agreeing to his response? It seems memories interwoven with people carry us forward. Yet, as with any life altering change, there had to be goodbyes. Some difficult, others casual. I've been wondering what decides the difference. Is it the impact they’ve made in my life? Is it the length of time I’ve known them? Is it knowing I might not see them for a long time? Is it accepting that no matter how difficult or not being able to because distance and time will separate souls that have learned and grown together? It's been strange coming to the realization that certain people seem to come into our lives at the exact right time and with them we can have experiences together that change the core of who we are if we are open. It's been strange realizing that others who have been around a long time can make their mark years later. Talking to the old friend from high school, we talked in a way we never could have during the past 18 years we've known each other. Until now. Until we had both traveled away from home, finished our education, become licensed professionals (in search of work coincidentally! ), and learned to listen to the universe. She had always listened because she had always seen. I had started to after the Arizona ghosts. For a brief moment, we shared stories about our lives that would solidify our bond for a lifetime. What makes a place speak and thereby last forever? Does it depend on the audience or ourselves? I can close my eyes and be standing on Mont Blanc at the top of Europe on a clear day surrounded by snowy peaks and blue skies. Or be standing by a beach in Barcelona on a Christmas Day many years ago with family members who are Buddhist. The change and the jump was inspired by an adventure, a road trip taken with friends, a “spirit quest” with an unintentional outcome. I am told we almost didn’t make it at one point driving through the slippery mud on the Navajo reservation but I was far too naive to realize that at the time. During the trip I saw a painting at our first random right. The painting was of a girl standing at the base of a mountain during sunset. You can't see her face. The moment I saw the painting I thought about how incredible it was that she was home. From there, I had to go home too. I may crash and burn. I understand that. But at least I would have tried. Even if the crash and burn is the end result, I will be able to say that in a world attempting to place everyone in boxes of one sort or another, I resisted. In a world that unjustly rewards the most fortunate (where fortune is rarely credited) while so cruelly punishing the less, I failed to conform to educationally-driven hierarchical expectations about my place in society. The paths I was supposed to take left untaken. The work I was supposed to do left undone. The choices I was supposed to make left unmade. Perhaps in that resistance, I will fail to achieve any tenable outcome. But at least I tried. The why is too complicated to comprehensively explain so I’ll just say this. The desert speaks only the truth and when one is forced to confront it there is no turning back. Once you hear the desert you can’t unhear it. It’s not answers I found in the desert. It’s questions. And if the desert is clear about any one thing it may be this: where one goes to find answers to the questions that keep one up at night may be far more important that both the questions and the answers. So to answer the why, it is about the where. And for the where, the journey is just beginning. Tonight, watching celestial powers playing with the color wheel of the Arizona sky, a last sunset brought an end to a four year journey. The past few months have been a time of reflection both of the past and the future. As the sky put on an unforgettable light show once again, I thought about the first sunset I remember watching in its entirety. Fortunately for cloud storage, my words from four years after seeing the first sunset were preserved. 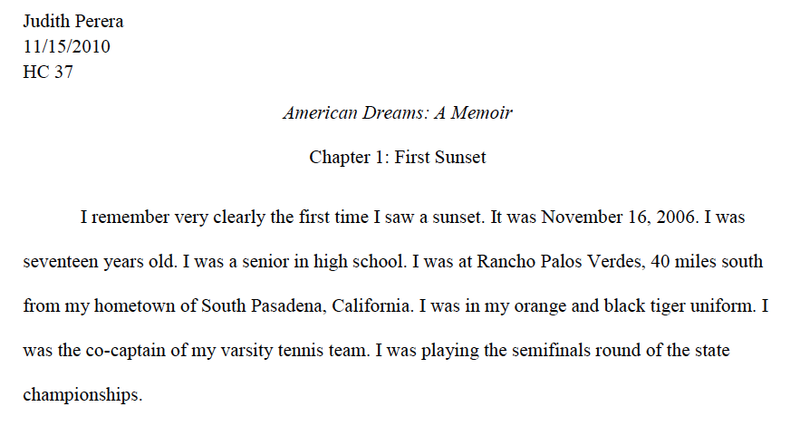 The final paper of a memoir writing class at UCLA. Reading those words almost a decade later, it seems oddly familiar and yet also strange. I was no longer the writer yet the writer had become me. I remember going to school the following Monday after that tennis match and trying to help a friend get over the loss (after an undefeated season). I tried to tell her how we should forget about it and move on. But our coach overheard the conversation and said, "You'll never forget this." I remember thinking how callous that was at the time. But I soon realized he was right. Years passed and the memory didn't fade. I guess at some point between that conversation in November 2006 and the memoir writing class at UCLA exactly four years later, I had tried to make sense of it. In that process, I, the writer, had narrated the first sunset as the end of a journey. In some ways, with many more years behind me now, that first sunset hardly seems significant at all. Much of my life remained the same afterward. I continued to live with my parents in California (while occasionally moving away during the week for college and law school). I never worked full-time. I remained a student even a decade later. While facing various moral, ethical, and even philosophical contradictions throughout college and law school, the center did not give way. In a state long battling actual fires, I found shelter and safety. Life went on as it did before. Just with less tennis. After all, California had always protected me. But in other ways, that first sunset had marked an end. There were no more bus rides with the team. No more uniforms. No more after-school practices. No more "undefeated" chants as the bus turned the corner and made its way up Diamond Avenue to park in front of the gym. No more cheering on teammates from the sidelines. No more sharing snacks and stories between matches. No more matches. No more competing. No more hiding on the tennis court because forehands were preferable to real life. When I met up with my coach last year, he remarked how our team was not only the most successful tennis team to have ever played at our high school, but we had attained a remarkable level of professional success as adults (with doctors, lawyers, teachers, and a range of other medical and scientific degrees and professions currently represented). The skewed demographic of the team considering the socioeconomic standing of our city probably made that somewhat inevitable. Yet, it is fascinating to think of those high schoolers dressed in orange and black who disembarked the bus that night to never board another as a team again. In that collective finality, individual lives would change. No matter how obviously, or trivially, it had been an end, the end of adolescence. Perhaps it is only right then to say that this last sunset in Arizona marks a beginning. The last night in a now empty apartment, will bring the dawn of a new adventure. No longer under pressure to perform academically (since school is finally done), no longer under first-generation-immigrant driven expectations to succeed within a narrow definition of success (since I can't seem to grasp how capital accumulation leads to happiness), no longer under obligations to not rock the boat and play by the rules (since what is read can't be unread), the last sunset in Arizona seems to be the start of a new way to live. A new way to be. In Arizona, I learned that even the sky can be set on fire. At some point during four years of incredible sunsets, amidst all those fires in the sky, a place that seemingly neither requires nor tolerates filters, intentionally or unintentionally, had also set me on fire. And so, the first time around the mysterious academic job cycle came to an end. In a way, it was quite opportune for things to work out as they did. At the end of a long year, I am left with two thoughts. One, I'm glad I got to see. Two, I'm not sure if I want to see any more. I decided to write this post because it seems so much of this world is hidden. As a faculty member recently put it, "Academic bureaucracy is as transparent as mud." So, with mud on my boots, I'm detailing my first year on the job market below in hopes that it may help someone in the future. I applied to 21 positions. I had four Skype interviews, one phone interview, and two interviews at the American Historical Association (AHA). (I'm still wondering why and how interviewing at the AHA is still a thing). Three of the Skype interviews led to on-campus interviews. One of those was at an R1 school and two were at liberal arts schools. I've heard from several faculty members how this constituted a "good year." 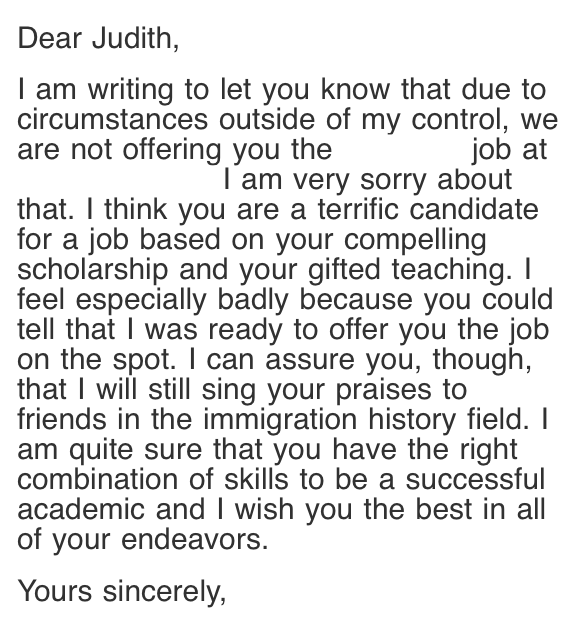 Despite finishing my Ph.D. in four years as well as having extensive teaching and public history experience, I had doubts whether I would be a competitive candidate. When I asked for theories about how all the interviews happened—since I was told repeatedly that it was typical to not hear back the first year on the job market—the responses usually referred either to my law degree and CA bar license or to my "topical and timely" research. Since I cannot know for sure, I'll leave it up to you to decipher. That is, of course, assuming there is any method to the madness. My first ever on-campus interview was at an R1 school a few weeks before I turned in the first full draft of my dissertation to the committee. I'm not saying that to be cavalier, but I am curious of the dynamics between what is rumored as purported requirements before even applying to certain jobs and the ways in which the interview process can actually play out. I had no academic publications and an R1 school invited me for an on campus interview? Why? The interview was quite the experience. The most surprising part to me was that when I inquired about whether the terms of tenure were negotiable—a pattern that would continue with most of the other interviews—the responses were underwhelming (and somewhat condescending since most people seemed to assume I did not understand how tenure worked). I simply wanted to know if they were the sort of people who thought outside the box. Meetings were followed by what felt like a very confrontational lunch session (for other reasons I cannot quite yet understand) where it seemed like I was testifying before Congress. Meeting the graduate students provided a temporary reprieve. I asked them where they were at in the program and when some mentioned their apprehension of starting their teaching assignments, I offered some advice that I hope was helpful (namely, to use monographs, teach topics of familiarity, and clock out after 20 hours to focus on research and writing). We then had a great time discussing what books should actually be assigned in historical methods so we can stop the cycle of generational grad student confusion stemming from that particular class. Coming directly from law school, that confusion lasted more than a year for me and was finally alleviated when a friend gave me Callum Brown's Postmodernism for Historians. That Christmas gift may have saved my graduate school education. The full day of meetings at the R1 school ended with the job talk. Knowing that the end of my talk would include some heavy content (in particular, tragic deaths at a detention center), I had to start off by engaging people with laughter. There is something quite entertaining (and challenging, of course!) about trying to get a room full of academics, who are also complete strangers, to laugh. I was definitely lucky because that particular audience brought the energy. As I walked back and forth, sometimes swinging my arms upward and other times pointing to the screen, it seemed they kept their focus on me the whole time. Regardless of whether they laughed, smiled, or nodded for the puns and sarcasm out of politeness or genuine entertainment, it certainly helped me perform at a higher level. Despite this, the Q&A session after my talk unfortunately provided me with the answer to my outside-the-box question. While many of the questions focused on historiography, future research, and teaching methodologies—with one faculty member asking me what "adaptive learning" was—the search committee's questions attempted to place me squarely within the parameters of the box of their ideal candidate. Despite recognizing their attempts to fit me into their box, I tried not to waver in my resolve to remain outside of it. What a fun game to play. When my answers were received with eye rolls visible to me from the front of the room, I had a feeling how the rest of the game would play out. At my second on-campus interview, a dean asked me whether I had a minimum salary. Seeing as how I have been in school my whole life and have never really had a full-time job, this was puzzling. I managed to muster up a quiet, "Honestly, I don't." Not to say that I actually don't but I was confused why someone would ask about a minimum salary before a contract is discussed. Wouldn't that be showing your hand even before the game begins? When I spoke with a group of students at that school over lunch, I mentioned how crazy it was that law schools tend to ignore prominent historical court cases like Dred Scott, Plessy, Buck, and Korematsu, and train attorneys in criminal law and procedure without ever mentioning mass incarceration. After I encouraged all the students to stay in touch if they had further questions, two African American students stayed after the meeting to pick up my business card. As we walked, one of them said, "I'm glad you said those things. I've never heard a professor say that." That rejection notice came by snail mail typed on a letterhead. Other notices continued by email. Interviewing at the AHA was a fascinating ordeal. When I inquired whether I needed to pay for the whole conference in order to attend the interviews since I did not plan on attending the conference, I received the following response: "If the interview is at a table in the Job Center room, you do need a badge. Our policy is that interviews in rooms require badges as well, but there won't be anyone checking at those doors. We do hope that all job candidates are able to take some time to take advantage of all the offerings at the meeting, such as the Professional Pathways career development space. We do have reduced rates for job seekers under the Unemployed/Underemployed or Student category that you would be welcome to utilize. We don't have single-day passes." Both my interviews were in rooms (one at the end of a long hallway several floors above where the conference was taking place). I had a badge just in case. After four years in Arizona, one gets used to carrying papers to justify being places. A faculty member at one of the AHA interviews replied to my thank you email with an offer to provide feedback. I was curious so I followed up. The comment about primary sources made me laugh. I'll offer an explanation for the record. During my research—ongoing at the time of the interview—I analyzed ICE reports of people who died in detention. I was told I had to take them seriously for my work to be considered "serious scholarship." But the reports spun tales so far removed from reality that they veered into the comical. So, it was a bit difficult to take the mention of primary sources seriously. Not only do I run all my classes in a discussion format, I use primary sources in almost every class; however, since I do not teach the exact same class twice, they are usually based on a timely topic I find interesting during class prep the day before. After all, I had just assumed Alfred North Whitehead was on to something when he wrote, "Knowledge does not keep any better than fish." But maybe I need to memorize a fixed list of primary sources? The main "political view"—I contest the moniker—I may have expressed during the interview was that my teaching philosophy stems from a prison abolitionist perspective because people should not be held in cages. So, should I have not mentioned that or toned it down? Having taught immigration history courses in Arizona, I have had students who wanted to change the asylum policy to no longer grant asylum to members of the LGBTQ community, to plant snipers at the border to shoot people coming in, and to bring pulled pork to class (which coincided with Ramadan) knowing there were Muslim students in attendance. Having a "range of political views" is certainly one way to put it. Sometimes I wonder how far this "range" can possibly extend in a society where both political parties agree on wars and prisons. Yet, even then, prison abolitionism is not my "political view." It's a lens through which I teach historical events and processes as a way to understand the world considering this particular society's tendency to resort to the cage en masse. How did society function for most of human history without human cages? While I detest politics of thought, this seems rather unsurprising in a profession that has long delayed the field's assessment of its own relation to the state, unable to stand against the tide of state interests. Will historians ever take the high road? For instance, consider the increasing move toward online teaching. Are we open to discussing the implications of online history teaching under the sometimes heavy-handed interference (or, guidance, depending on your experience) of "instructional designers," a growing field with roots in military training? Or, are such discussions complicated by the "politics" of it all as departments grapple with fiscal concerns and appeasing higher-ups? Are historians willing to rise above? As a brilliant colleague once remarked, "I am still in shock that professors haven't freed themselves from the swamp of American politics." One must look no further than the transparent-as-mud search process to see the consequences when those unable to escape the political swamp hold sway. There were three people at that particular AHA interview. Did that mean a single person broke the tie because of "politics"? I wonder why historical knowledge and teaching ability, both uncontested, were not able to overcome. Leaving aside all that, what struck me most about this job cycle was the unoriginality of the questions asked. It seemed at each interview, everyone in the search committee had a neat little form in front of them that they filled out as I talked. They asked the same questions, took turns going down their list, and did not often stray regardless of whatever I felt like throwing into my answer. That was disappointing. As an oral history practitioner itching to go off-script based on verbal and non-verbal cues, it was remarkable how collectively terrible the follow-up questions were. But I suppose it must be that way to make sure the candidate fits the box(es) and whatever standard of equality is presupposed to maintain external credibility of the search process. I hear appearances are everything. And I guess I should not be surprised being in a society that has long embraced mandatory minimums as the gold standard of equal protection. But I certainly wish it was different. So, be cautious, future job seekers—make sure you fit the box(es). Yet, even then, mysterious circumstances (or, "politics") can uncheck the box(es). The last email, which appears at the start of this blog, was bittersweet. After the job talk/teaching demonstration, the chair was ready to offer me the job and told me in no uncertain terms that I was their first choice. First choice. The chair said to expect a call from the dean with an offer and that I should feel free to negotiate. It felt like I had made it. The email a week later informing me that I had not was a reminder that perhaps it was not a world in which I wanted to make it, if making it required fitting into a box subject to mysterious circumstances. First choice or not. I want to say that I will take some time to work on the "politics" of my research and teaching as recommended but that seems highly unlikely bordering on never. Trying to fit into a box on a form seems absolutely terrifying, even more so when fitting into the box ultimately becomes irrelevant. What I have grown to love most about history is the potential to transcend the box in whatever shape or form. Going through this job cycle, however, it was heartbreaking to see that potential not realized, the discussion points never picked up, and the hints dropped never pursued. I wish someone had asked how I knew what blood looks like on tar. Or if I could identify detention centers with my eyes closed. Or what it feels like to walk a desert filled with ghosts. I've been wondering if it is just me. Norman Maclean once wrote, "If a storyteller thinks enough of storytelling to regard it as a calling, unlike a historian he cannot turn from the sufferings of his characters. A storyteller, unlike a historian, must follow compassion wherever it leads him. He must be able to accompany his characters, even into smoke and fire, and bear witness to what they thought and felt even when they themselves no longer knew." If the distinction holds, perhaps the title most fitting for me was never a historian. Regardless, I'm grateful for all that I saw this past year. I traveled to parts of the country that I'd never been to before. I told more than 100 people about my research and teaching. I honed my presentation skills. And I still smile when I think about the time during one of the on campus visits when I walked myself across the street from the hotel to a restaurant for a dinner meeting and the chair was visibly upset that I had done so without waiting to be escorted. One would think a candidate being able to find their own way would garner at least a little respect rather than annoyance. But clearly, there's so much I don't understand. And so the final curtain call. After 26 consecutive years playing the role of a student attending an educational institution, it is time to say goodbye. Playing this role has been remarkable. I was too young to have memories of when it first began but can say with some certainty that I remember most of the performances. I traversed the planet. I learned languages. I studied abroad while studying abroad. I saw fireworks in four different countries on three different continents. I went by different names. I played the extrovert and was told not to talk in class so much and yet was selected for school plays and church readings. I played the introvert and was told to speak up in class and not be shy. I read a lot; it turns out mostly the wrong books. But at least I learned to read. I wrote a lot too; it turns out that was helpful for when writing became part of the job. Good thing the voices were always so chatty. What strikes me now is that playing this role has been the sole focus of my life so far. It is all I have ever done or known. That focus gave me expertise. I honed the skill over the more than two decades of practice. It was validation. It provided safety. It was home. I am not sure who I am without the part. In some ways, I am hesitant what the next phase brings after such a long-term role. It is not that I will stop learning like a student. But I wonder what happens when the goal of getting a degree or graduating is no longer part of the life timeline. I wonder if the skills that translate (assuming any in fact do) to whatever it is that the adults call the real world are still limited without that particular end goal. And I wonder what that end goal is in the so-called real world. Living in Arizona for nearly four years, the real world certainly came knocking. In Arizona, I found two things: the desert and the ghosts. One is beautiful. The other tells stories. So I learned to stare at the colors of spectacular sunsets and listen. I was a scribe to the stories of the desert ghosts. I wonder if that ends with the end of this role. I hope not. I suppose before I leave this state, I may have some sort of real world end goal. Or maybe not. Perhaps it is time to be without. It would be a first. I suppose time will tell. What I hope now more than anything is to be able to look back on this role with gratitude. To appreciate these final days and the final performances. To think about the performances, the terrible ones, the awesome ones, and everything in between and smile. If, for nothing else, believe that the performances were every bit worth it. And then take a bow. After all, it has truly been a role of a lifetime. The gates with the lions are gone. Recently, it occurred to me how influential those gates had been. Each made of metal had the outline of a lion facing the other. They were green. I'm not sure whether Statue-of-Liberty green or not. But they were hardly a sight to behold. Rusting, old, creaky. At least I think creaky. I don't remember anymore. It's been nearly two decades. I do remember standing on them, my feet fitting perfectly on the feet of one of the lions. I used to stand on the left lion, the left gate. I'm not sure why. Probably didn't give me the best view of the street. But there I was spending afternoon after afternoon under the hot tropical sun standing at the rusting lion's feet staring into the busy, noisy street. That I remember. It's hard to get the honking out of my head. I'd fold my arms and rest my chin on them. Sometimes the metal was too hot. On those days, I'd just stare. Always I'd dream. I'd dream about being away. I'd dream about flying. I'd dream about making my way to the airport because I knew then I could fly. I'd dream about being somewhere else, anywhere else. I never told the lions. Never even whispered it. But perhaps they knew. Perhaps they too wanted to be somewhere, anywhere else. It has been strange realizing that she, that I, never got off that gate. That she, and I, had spent two decades standing on the gate staring into a busy street dreaming of being away. Whether it was the grip of the left lion, or something else, I never got off the gate. Regardless of all the travels, of all the places I have seen, I had stayed tethered to the green decrepit metal always dreaming of being away. Perhaps it's time to look around to flip through the moving pictures of the past and find stillness in the memories of the present. Perhaps it's time to realize the lions had let go a long time ago. Perhaps it's time I did too. I want to start with two thoughts. One, happy birthday, Ammi! Two, I'm sorry I can't be there to celebrate with you. Seeing as how I am more than 9,500 miles away from you on this birthday, I cannot help but think about your last one when those miles were surmountable. When I was able to wish you in person very close to the day of your actual birthday. And the year before that. And the year before that. In fact, every year I've been alive, I think I have spent your birthday with you. Until this year. And it got me thinking about time. I thought how strange it is that since the two of us have been separated by borders, I have kept track of time differently. Normally, I would count down to various events -- birthdays, graduations, holidays. I would cross days off in a calendar. But since I saw you last May, I no longer cross off. I no longer count down. It has been 358 days since I last saw you in person. It will likely be as many and more before I see you again. When the sun rises tomorrow, the number will go up. And I will keep counting. I don't think this is unique to me. I've heard it before -- when I visit people in detention, they have often told me exactly how many days they have been in lock up. I don't mean to compare experiences. Just that sometimes distance and time may feel the same. They don't know when they will get out. But they know how long it has been since they last saw their family. They count up in days, weeks, months, and years. I suppose then there is count down time and count up time. Count down for those who know when. Count up for those who do not. But for now, a virtual hug from me with a phone call. Someday soon, in time, a real hug. Over the last several months, and perhaps over the last year, I’ve had the pleasure of listening to citizen-friends discuss the implications of this election cycle. Among the voices were those hell-bent on making their voice heard at the polls and those similarly hell-bent on making their voice heard by purposefully disregarding the entire voting process. And of course everyone in between. From the perspective of an aspirational non-citizen voter-to-be, it was initially difficult for me to understand the point of view of voting by not voting. I couldn’t quite figure out how by disregarding the entire process, a citizen-voter can still be heard. Slowly, I’m beginning to see that point of view. If one considers overhauling the entire system on a structural level, then perhaps that viewpoint holds sway. Perhaps collective disengagement can provide a starting point for systematic restructuring. This post, however, leaves this group of strict non-voters out of the momentary picture with the implicit hope that the revolution, in whatever form non-voters hope for, may come in due time. I know that many wonder if their vote even matters with the way elections are structured. Whether it really makes a difference one way or another if one person shows up to the polls or not. Yet, I wonder if I could be so bold as to suggest an alternative framing. What if I asked you to consider the power your vote could potentially hold in the life of someone you knew? What if I asked you to consider those in your life who cannot vote? Perhaps you know someone who is not a citizen? Perhaps you know someone serving time behind bars? Perhaps you know a family without legal status? Perhaps you know someone who has lost their right to vote? You knowing someone who cannot vote means you might know their story. Perhaps then you might even support their interests. Policies that benefit you could be aligned with policies that might benefit them. Would it then be a stretch to think of your vote as also representing theirs? Would it be a stretch to say that when you check yes or no or choose one candidate or one proposition over another, they are in your mind? Could their stories occupy that voting booth with you? Will their voices blend with your thoughts? So, by you voting, are they also voting? I encourage you to consider for those whom you speak. Those you represent. You represent your friend who is not a citizen (according to one estimate, there were more than 22 million noncitizens in the US in 2015). You represent your neighbor behind bars (48 states have some type of felon voting laws). You represent your friends without legal status (according to DHS, this number is more than 11 million). You represent your coworker, neighbor, friend, ally, and stranger who have never had a vote or have lost their right to vote for one reason or another. I hope you represent those without a voice. And if in this election cycle you take the time to do so, then from one non-citizen, non-voter to a citizen-voter, thank you. "No one case is worth your license." The day began as a day of firsts. My first time as an attorney in a courtroom. My first time as an attorney in an immigration courtroom. My first time representing a client in said courtroom. My first time stating my full name and then the words "for the respondent." Needless to say, it was the first time I ever felt that nervous. What should have been a short hearing on a procedural matter turned out to be a terribly tragic drama. After the judge entered the courtroom, she sized me up, warned me about being careful about what I say into the record, and stated (off the record), "No one case is worth your license." I was perplexed. What on earth was she talking about? Why would I lose my license to practice law for showing up to represent someone in immigrant detention as a pro bono attorney? After dismissing the procedural matter that I was there to represent the client for, she immediately moved on to the second matter at hand. Long story short, there was no way I could ethically take on representation for the second matter as I had little to no preparation. After I admitted this to the judge and asked for more time, she rejected the request, excused me, and proceeded with the second matter. I watched helplessly as my client was grilled for three hours and then ordered removed from the country. There was nothing I could do. Despite the three years of law school, despite acing Immigration Law, despite passing the CA bar, I sat helplessly as a person in a black robe sitting in front of a sign that read "Qui Pro Domina Justitia Sequitur" brought an immigrant to tears. My client, better known as the "case" at hand, became one of the thousands thrown into the pile of refuse, the rejects "justice" deems unworthy of living among us in this great nation of immigrants. There were six people in that courtroom. All have undoubtedly made mistakes in their lives. Yet, only one was handpicked by "justice" to suffer and pay for her mistakes by being removed from a country she has lived in for nearly 20 years. On the way home and for days later, the statement still rings in my head. I keep going over what happened and wonder whether I could have done something differently. Realistically I know that I could not have possibly represented her in the second matter. But the sting of what happened remains with me. And the echo of those words remain hanging in the air. I wonder if there would be a "case" that was worth a license. Maybe she is right and no one "case" is. But maybe because they all are so no one "case" can be. Because behind every "case" is a person. And every person, regardless of who they are, would be worth it, right? It seems regardless of the work or the effort or the skills or the time or the pure dumb luck it took for me to earn that license, it is not the most important thing in the world. Far from it. As I try to move on from the echo of those words, it seems to me that there would be no greater privilege than losing a license if it happened in defense of the most vulnerable among us. Because at least then I would know I tried. I must admit it was not my first thought of the day. Until Facebook decided to not-so-subtly remind me, it did not occur to me that today is Father's Day when I woke up this morning. I had heard some commercials on the radio last week. I had seen some posts on Twitter. But until I saw the trending topics of the day, today was going to be another Sunday. And then I realized it was not. As I scrolled through my newsfeed looking at friends and family celebrating this day with pictures and words I realized something. This day will always be complicated. Regardless of the year, the third Sunday of June will always be a day of confusion, like a national holiday marred by a complicated history reflected in a tumultuous present and a uncertain future. A Facebook post could never reflect this complexity. I'm not sure if words could either. Even if I could begin to decipher the origins of a relationship left in pieces, it seems difficult to identify a beginning of where it went wrong. I remember a time when he was my hero. A time when I thought he hung the moon. A time when he picked me up and held me upside down in our kitchen and showed me the world in a new perspective. I remember a time when I waited for him to come home from his many trips abroad. A time when I envied his large stack of passports indicating his travels to many different countries. A time when he brought all sorts of goodies from faraway places. A time when a hero could do no wrong. And then I suppose life happened. I suppose life stressed him out. I suppose circumstances turned him unkind. I suppose situations became too hard to handle. I suppose at one point he broke. I suppose then cruelty and emotional distress became a new way of life. I suppose that's when the house turned cold. I suppose that's when we stopped communicating. I suppose that's when I stopped caring. It has been 547 days since I last dialed his number. In that time, I have changed. He used to tell me to first save myself before I can save others. I no longer believe that. I have no desire or intent to save anyone. But I do want to help. I want to help as many people as I possibly can while I'm still here. I want to help despite my own troubles or circumstances or uncertainties. I want to help despite not knowing what the future may hold. I want to turn my attention to the world around me. I want to understand the problems we are facing and be a part of the solution. I do not want to ever let my life be about me. In that way, he is the foil. Regardless of the questionable genes I have inherited, I want to do good. I want to do and be good. So, in a way, I am grateful for the antithesis. Maybe someday I will be able to celebrate that. "I used to be a racist." 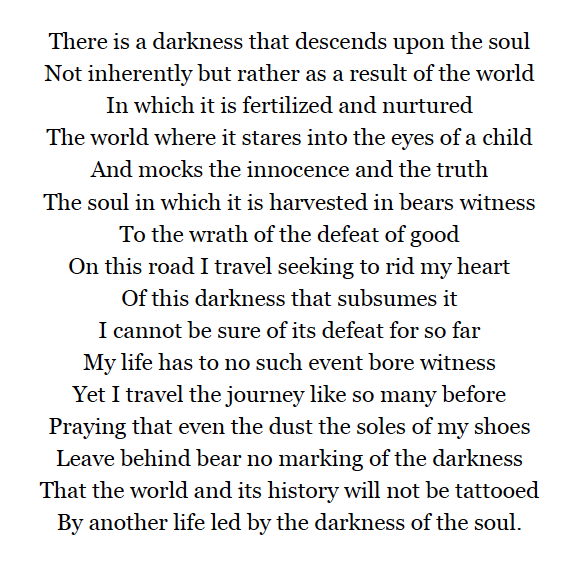 Four days into my summer history class, I began my lecture with these words against a dark backdrop of a Powerpoint slide reading, "My Confession." The class is about immigration. We cannot talk about immigration without talking about race. So, I was trying to talk about race. In some detail, I recalled my segregated elementary school days in Sri Lanka. I attended class with Sinhalese kids while never even interacting with the Tamil ones. I had friends who were Catholic, Buddhist, and Islamic but none who were Hindu. Even after I was taught Tamil as a second language, I never bothered to make any Tamil-speaking friends. Because at the heart of it was a fear. Whenever there was a suicide bombing or some other act of violence related to the civil war, I would come to school and mentally blame the kids in the segregated classroom I never entered. I never learned their names. I never even saw their faces. I blamed and feared an entire group of children for the actions of a few people simply based on race. I used to be a racist. I did not tell this story to be controversial. I told this story because the fact that I learned to unlearn my childhood racist ideas meant that I was open-minded when it came to race. It turns out, I'm also open-minded when it comes to gender. However, I contrasted this with religion. I told the class that when it comes to religion, for better or for worse, I'm not open-minded about it. I neither want to debate nor discuss it with anyone. That I had to learn about myself. Why did this matter? I believe open-mindedness opens the door for sympathy. Sympathy can lead to empathy. Empathy can lead to understanding. Understanding can lead to learning. Along the way, there is no guarantee of each step leading to the next but there is potential. In order to learn about immigration, the students would have to question where they stood when it came to race. Without having that conversation with themselves, they may learn precious little in conversations with others or in the class. Last week a friend insisted that while I could admit to being a former racist in an undergraduate history class at ASU, he, as a white man, could not. I have no doubt that whatever prejudices he may have had in the past (assuming he had any at all), he no longer does. That is an absolute certainty. Yet, somehow he could not admit that. But can this be different? Can we openly discuss our inherent biases and prejudices? Can we understand where our ideas about other people come from? Can we openly confess our pasts? Can we explore why we see certain lives as more important than others? Can we ask these questions both individually and collectively regardless of our own backgrounds? Or are we doomed to continue to discuss and learn about topics without possible root causes? Toward the end of class, a white, male student from the South admitted to being a “recovering racist.” I stood there and took in the moment. Two people who had vastly different childhoods, born on two continents, yet raised in similar bigotry, had publicly confessed to what few would dare say out-loud. Maybe we can have conversations about race after all. And maybe then, we can talk about immigration. Maybe I should have seen it coming. At a botanical gardens last week in the country where I was born, I witnessed the inherently problematic nature of the supposedly clear divide between "local" and "foreign." As my mom waited in line for tickets, I noticed a strange sign: the fee was 100 rupees (0.7 USD) for "locals" and 1,000 rupees (7 USD) for "foreigners." I stood there and nearly laughed out loud thinking it was some clever park ranger's version of a leftover April fools' trick. But this was no joke. The scene took an interesting twist when several park officials (dressed eerily like police officers) took it upon themselves to question my national-ness: whether I sufficiently qualified as a "local" to deserve the lower fare. As they searched through my backpack, they asked where I was from. Instead of a long drawn-out family history, I simply told them the name of my childhood hometown. It didn't ease their concerns. I confused them: I looked like a "local" but sounded like a "foreigner." The discriminatory fee board did not account for the likes of me. As I grappled with the notion of non-belonging in a place of supposedly inherent belonging, one thought occurred to me. The look of confusion in their eyes revealed the product of an immigrant way of life: even where you are supposed to belong, you don't. Maybe at some point you did, but you no longer do. Several days later the scene repeated at an elephant orphanage. This time the distinction was greater: 100 rupees for "locals" and 2,500 rupees (17 USD) for "foreign adults." Since the stakes were higher, the security guard asked me directly if I understood Sinhalese, his question sounding more like a statement of fact from a disappointed older relative. Never mind there is a significant minority of "locals" who speak another language. To him, 2,400 rupees was on the line. In my best nonchalant Sinhalese I could muster, I answered him dismissively and proceeded to the gate. I later wondered if a silent treatment and the showing of my "local" passport would have been sufficient. That answer came at the departure counter at the Colombo airport. The emigration officer insisted my passport picture did not resemble me and then wanted to know why I did not have a National I.D. Not knowing if a country had a right to prevent its citizens from leaving and thinking that it probably did, I played along if only to just leave as soon as I could. I told him I had lived abroad for many years. More questions followed. Maybe he thought I didn't deserve to have the "local" passport. Maybe he was right. I wish words could explain this feeling of non-belonging, of permanent estrangement in a supposed homeland, of being stuck somewhere in between. But maybe that's the point -- maybe the fact that this phenomenon is difficult to describe adds to its strangeness. And maybe even to its universality. Maybe what cannot be explained in words can be felt in the hearts of people around the world struggling to define themselves in a purportedly binary world of "locals" and "foreigners." Maybe those who exist somewhere in between can compel the rest to reevaluate the existence of the binary. And then maybe we can live in a time when someone is neither put into a box nor compelled to choose one. "I can't believe I'm out." In the nearly three hours on a random April night when our lives crossed paths, she uttered that phrase numerous times. I wanted to ask but I did not. I would not have to. She had left her birthplace nearly a year ago. She travelled through 18 countries. Mostly she walked. She spent nearly a week in the jungle without food. At one point, her passport was robbed and she lost her identity. Yet she walked some more. After eight months of traveling she finally made it to the border. A few hours in the Sonora desert and she was in Arizona. Then she was arrested. I walked through that desert this morning. The crunch the rocks make beneath your shoes echo through the landscape of peppered cacti. It is both beautiful and terrifying. The desert floor rejects your attempts to imprint your footsteps on it. At every step there's a plant waiting to attack trespassers. The space feels haunted. Yet, the place feels familiar. After being arrested by our increasingly efficient border patrol, she was held in "detention" for four months while they assessed her national security risk. It's a strange word to use in the context of her story -- her descriptions of inadequate food and being forced to smuggle bare bones provisions of noodles from the commissary only to have those taken by the guards; her stories of being forced to labor as punishment for not following strict rules; her accounts of the lack of proper medical care where the prescription for every conceivable ailment is to "drink water." "Detention" connotes a sense of harmlessness and benevolence. Her experiences denote torment and tragedy. Walking through the desert, I wondered how we got here. How did we come to the point in an increasingly globalized world betraying physical borders on a daily and minute-by-minute basis to so severely punish those who seek to transcend? Can we look past the lines in the sand that have been arbitrarily drawn and look into the eyes of unbelievable courage in the stranger? Can we recognize her stubborn determination? Can we see her desire for a better life akin to our daily struggles and ambitions? Can we look in her eyes and see ourselves? In a public park on Sunday evening, a bomb blasts. As the Christian world celebrates Easter, at least 52 people lie dead. Another 200 are injured, among them, children. This was the first news article I read this morning. I want to believe that we will take the time today to say a prayer for those who have lost their lives, pray for healing for those among the injured, and pray for peace. Yet, most of us, will not. Because it happened in Lahore. If those killed and injured had been in a public park in the western world, our profile pictures would change to reflect our somber remembrance of their lives. Our tweets will hashtag their country of nationality while we hold our virtual hands together in prayer and solidarity. We did for London. We did for Paris. We did for Brussels. But we will not for Lahore. On some level, this seems unjust. It seems callous of us to select those for whom we will collectively mourn. Yet, on another level, it seems understandable. In a time when suicide bombings seem common in certain parts of the world, it appears almost reasonable of us to only mourn the times when it happens in places it should not. Instead of engulfing ourselves in perpetual mourning, we choose the ones we can cry for. We can mourn for. We can pray for. We can remember. But I wonder how much of ourselves we lose in making that choice. I wonder how much of our humanity we sacrifice by scrolling without pausing. In the selectivity of our collective mourning, we once again distinguish between those who matter and those who do not. We differentiate. We divide. And in that division, most of the victims of our global violence will go without being remembered. Their families will bury the dead knowing that they live in a world where their loved ones were not included in our collective grief. To at least lessen that pain, we should remember Lahore. Today marks a significant day. Significant not because of anything that happened on this somewhat ordinary Tuesday but rather what happened fifteen years ago. On February 16, 2001, I broke metaphorical ties with a homeland I never quite felt any attachment to and moved half way around the world seeking permanence. In the decade and a half since that day, the search for permanence has proved elusive. It seems hardly a day has passed by when I have not been reminded of my outsider status, the inherent impermanence of strangerhood. Hardly a day has gone by when I have not felt the pressure of being a first-generation immigrant, shouldering the responsibility of both honoring a superficial family name evidenced by parental sacrifice and countering anti-immigrant sentiment looking to fuel the flame of nativist fires. And yet in that state of impermanence, I have learned to appreciate the everyday. For each day I wake up in this undoubtedly spectacular place of shelter and refuge, I am grateful. I am grateful for the time and the lessons. I am grateful for being able to embrace the uncertainty both of my immigrant (or more accurately, nonimmigrant) status and of life. I am grateful for understanding where I came from and how that has shaped my perspective. I am grateful for friends who have welcomed me. I am grateful for family that has stood by me. I am grateful for the shelter of a country finding its way. Fifteen years. For fifteen years, I had the luxury of living among some of the kindest people I have ever known. For fifteen years, I had the good fortune of being educated by some of the smartest people in the world. For fifteen years, I learned from teachers, from coaches, from friends, from neighbors, and from strangers. For fifteen years, I had the chance to laugh, to cry, to be afraid, to hold on, to smile. Whatever the next fifteen years will bring, and wherever the road may lead, I know that it is because of the last fifteen that I will have the strength, courage, determination, and fortitude to face the future. For that, above all else, I am grateful in this fifteenth year. On a cold, foggy morning five days before Christmas, my uncle and I headed east from Grand Saconnex, Geneva, along Route Blanche, to Chamonix, France. From Chamonix, we took a cable car up to Mont Blanc ("White Mountain"), the highest peak in the Alps. I was not sure of what to expect. Walking onto a wooden deck at one of the viewing points and being surrounded by indescribable scenery was a moment of surrealism. I was where few will ever be. Of those who live, have lived, or will ever live, most would probably never step foot there at the top of Europe. I wondered about what this place signified. This place belonging to the world but restricted to a few. This place tightly controlled by borders and immigration policies. This place of highly skewed visitor demographics. This place of exclusivity. This place many would talk about but would never get to see. This place transformed into cliche yet indescribable in mere words. This place resembling the pictures yet defying the imagination. This place of wonder. I wondered about how I got to be there. I was at Mont Blanc by pure chance. The good fortune of having relatives living close by. The blessing of a flexible job. The luxury of making enough to take a vacation. The by chance permission granted by a consulate officer having a good day. I did not earn this luxury, yet I was enjoying the privilege. The good fortune of my life was never more obvious to me than when I stood on that wooden deck staring at a panoramic view of snow capped peaks surrounded by the bright glare of sunshine amidst clear blue skies. I wondered what being there could mean. Could I still empathize the migrant, immigrant, refugee, and asylee experiences after setting foot in this place at the top of Europe? Does being in this place forever blind me to the plight of those enduring harsh immigration policies? Could I ever be able to see beyond the snow capped peaks of this exclusive space? Would I still be able to understand? The answers seem hardly clear. Yet one aspect seems certain. Whether they are the Alps of France, or the Alps of Switzerland, or the Alps of Italy or the Alps of any other Alpine State, they bear one universal characteristic: they are the Alps of the Privileged. I am among the privileged. Two Wednesdays ago I sat in the lobby of a foreign consulate office in San Francisco and waited for my name to be called. I was early for my 11:45 am appointment. At around 11:40, the officer at the window with a sign that read "Visas Only" motioned for me to approach. I walked past the two other windows with the signs "Citizens Only" and stood in front of her. I was there to apply for a visa to visit family abroad. On a good day, the visa would be granted. On a not-so-good-day, it would be denied. The odds were fifty-fifty considering the power and discretion of consulate officials. Ten minutes later, it turned out to be a good day. Another stamp on my passport that would arrive in the mail a week later. One Wednesday ago I sat in the lobby of a privately-owned immigrant detention center under contract with the federal government and waited for the clock to strike 7:30 am. We were early for our appointment. At about five past the half hour, we walked in, handed them our IDs, removed our shoes and placed them in a gray tray before proceeding through a metal detector. The scene was eerily reminiscent of a TSA checkpoint. I was there with a group who visited immigrant detainees cycling through a system that can best be described as absurd. On the best days, immigrants are locked up with no access to a lawyer, fighting against continual delays in their hearings and highly inflated bond amounts. On the worst days, immigrants are found dead in their cells. This was Eloy Detention Center, a place notorious for their inability to keep their charges alive. After visiting with several detainees and hearing the grueling journeys they endured to get to the border, I wondered about how two people could share a common space across a desk in a waiting room smelling like ammonia yet be perpetually separated by extraordinary circumstances beyond either of their control. Circumstances that a twenty minute conversation and a handshake could never bridge. When I returned home, I found my passport with a new stamp waiting for me. I want to understand this strange occurrence. How is it that I get to walk into an air-conditioned consulate office and walk out with permission to visit a foreign country? How is it that my journey to the U.S. did not involve traveling thousands of miles on foot, paying fees to countries along the way that detained me, paying more fees to smugglers to guide a part of the journey, and ultimately making it to the border only to be summarily arrested and detained for months or years at a time? How is it that some people never have nor ever will have the chance to do things "the right way," yet we still expect everyone to play by the blanket, strict, unforgiving rules? I waited for a week hoping some insights would dawn on me. But I have none. I am no less curious, no less concerned, no less confused. All I have are stories of lives separated by space and time, separated by legality and illegality, separated by arbitrary rules and unforgiving punishments, separated between Wednesdays. For someone who spent most of her life living close to an ocean, whether it was the Indian or the Pacific, being landlocked in the Grand Canyon State has taken a toll. There is something about the ocean that has always provided a sense of calm. A sense of home. A sense of perspective that remains unparalleled. Perhaps driving through the vastness of the red Arizona desert may come close but it is definitely not the same as breathing in the ocean air with ones toes in the sand and conversing silently with rolling waves. Last weekend I headed west to San Diego for a friend's wedding. I had not visited the city in nearly a decade. Much had changed from how I remembered it. The random one-way streets reminded me of San Francisco. The wedding, of course, was beautiful. I met people who I had only ever heard about. There were faces to the names. I caught up with old friends in their new lives. Questions sparked conversations. What do you do? How do you like Arizona? So you're going to be an academic? The answers to those questions should be straightforward but as I pondered them some more, they were not. After politely responding during the various conversations with strangers, the questions lingered in my mind well into the night. Do I know what I do? How do I really like Arizona? Had I really thought through the decision about being or not being an academic? I decided it was time to see the ocean for some answers. Or, at the very least, some perspective. The next morning, I headed southwest toward Coronado. Going over the San Diego-Coronado Bridge I spotted the thin blue line of water and instinctually smiled. It was familiar. It felt like home. Walking along Ocean Boulevard, the sound of the rolling waves brought me immense joy. I hurried along the wall of neatly stacked rocks and made my way toward the water. I walked along the sandy beach for a while. I spotted a couple unsuccessfully trying to get their little girl to step into the water. After screaming in protest, she was allowed to go back to building her sand castle safely away from the threat of wetness. I passed by a group of people doing push-ups while a man with a whistle around his neck yelled at them. I was sure those people had paid money to be there and endure that sort of motivational Sunday sermon. I saw a man with a metal detector sifting through the sand for coins. He had found a few already. I sat down a few feet away from a lady relaxing on her beach towel. It was a little past nine in the morning and it was 75 degrees. I couldn't remember the last time it had been 75 degrees at nine in the morning! I smiled to myself at the thought of having to drive back to the Arizona heat later that day. It seemed only slightly ironic. I watched the waves rolling in and out. I watched a few surfers. I watched as the sun peeked in and out through some grayish clouds. I patiently waited for the ocean to speak. In the quiet through the rolling waves and the white noise of other ocean-goers, the ocean insisted: do something that matters and something that makes you happy. If you're fortunate, it will be one and the same. After all, that is exactly what the ocean has always been.